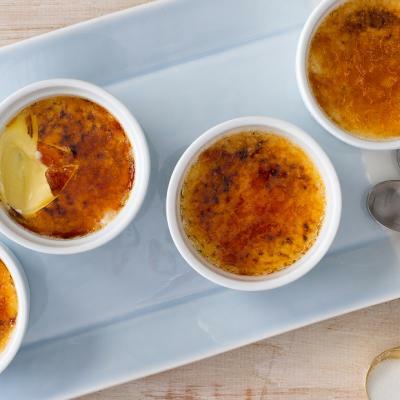 This smooth, delicious lemon cream is the perfect way to finish a meal on a light note. Pastry Chef Patrice Demers brought together summer in a cup for us to enjoy. In a saucepan, bring the lemon juice and zest to a boil. In a bowl, whisk the eggs and sugar together. While whisking, gradually pour the boiling lemon mixture into the eggs and sugar. Pour into the saucepan and return to high heat. Cook while whisking constantly until it starts to boil. Pour the curd through a fine strainer into a deep bowl, add the butter, and blend with an immersion blender or a whisk if you don’t have an immersion blender. Pour the lemon curd into about 1/2 cup (125 mL) glasses and allow them to set in the refrigerator for at least 6 hours. In a bowl, combine the egg whites and sugar. Place the bowl over a saucepan of simmering water and stir with a heatproof flexible spatula until the sugar appears to have melted and the mixture is slightly warm to the touch. Using an electric mixer on medium speed, beat the mixture until a shiny meringue forms with soft, glossy peaks. Using a heatproof flexible spatula, gently fold the 2 tbsp (30 mL) of poppy seeds into the meringue mixture. Using an icing bag with a plain tip, form round meringues that are about 2 cm in diameter on a cookie sheet lined with parchment paper. Sprinkle the meringues with the remaining poppy seeds. Put the meringues in the oven and check to see if they are crispy after 1 h 30 min. If they still seem soft in the centre, return to the oven for another 30 minutes. Allow the meringues to cool and store them in a sealed container at room temperature. In a saucepan, bring cream and salt to a boil. Remove from heat, add the sweet clover, cover and let stand for 5 minutes. Strain the mixture and pour over the chocolate wafers in a deep bowl. Let stand for 30 seconds. Mix with an immersion blender or a whisk if you don’t have an immersion blender. Gradually pour the cold cream while blending. 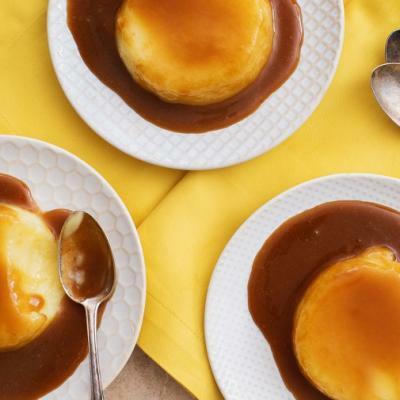 In a large skillet, heat the maple syrup on high heat so it caramelizes slightly. Add the blueberries and cook for a few seconds to heat them through. Remove from heat, add the lemon juice and zest; allow mixture to cool for a few minutes. 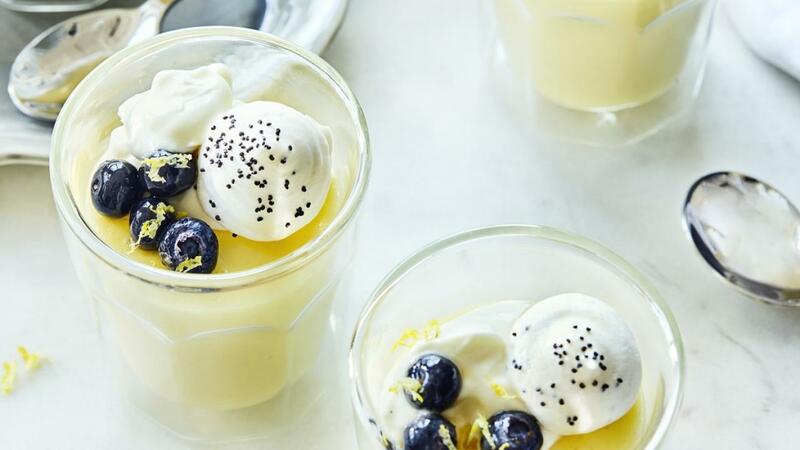 Place a heaping spoonful of warm blueberries on top of each glass of lemon curd. Top the blueberries with a few poppy seed meringues. Whip the Chantilly cream on medium speed until soft peaks form (it is very important not to over-whip the cream; since it contains chocolate, there is a risk of it becoming grainy). 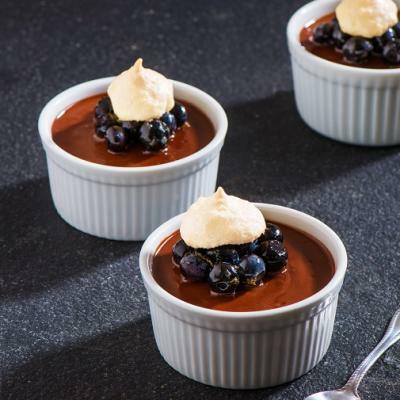 Garnish each dessert with the Chantilly cream and serve. · Lemon curd: can be stored in the refrigerator for 4 days. · Poppy seed meringues: This recipe makes more meringue than you will need for 8 desserts. However, the meringues can be stored in a sealed container at room temperature for several days. They are delicious snacks and the perfect complement to ice cream and fruit.